#5 – Victoria and Albert's (8%) – located at Disney’s Grand Floridian Resort and Spa, Victoria and Albert's is the platinum standard for fine dining at WDW. It is also the only one that has a strictly enforced dress code. Known as “V&A” among the Disney set, this restaurant embodies an elegant Victorian décor with 5 star service and a truly gourmet menu. The menu changes regularly and prices start at $135 per person for dinner (there are, however, certain menu items you can order for an additional charge – like Imperial Osetra Caviar at $210 per ounce). Situated in the kitchen and amidst the amazing staff who prepare your meals, the Chef's Table at V&A's gives you the chance to meet the chef and have your custom meal prepared to your liking. 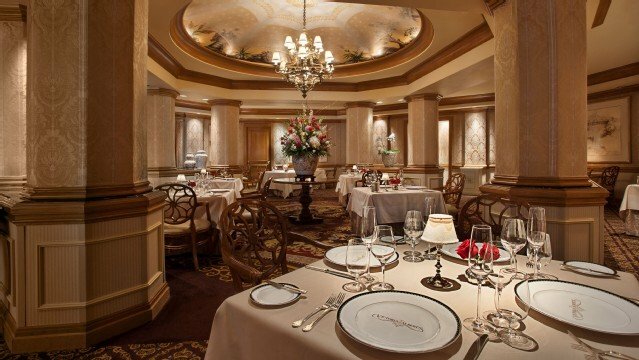 You also pay for the experience - at $210 per person (not including tax and gratuity) it is likely to be one of the more expensive meals you'll ever have, but also one of the finest. If you're interested in the Chef's Table you will need to book 180 days in advance TO THE DAY. There is only one seating per night at the Chef's Table and it sells out quickly. #4 – Narcoossee's (9%) – coming in at #4 on our poll is Narcoossee's. While also at the Grand Floridian, this is a much more laid-back atmosphere with an emphasis on seafood, but there's plenty to enjoy for the non-seafood eater as well. Entrées range from $35-$75 and include items like Wild King Salmon ($42) and for the glutton in the family, you can enjoy the two-pound steamed Maine Lobster ($69). From its position overlooking Bay Lake, you can also get a beautiful view of the Magic Kingdom fireworks from here. #3 – Jiko (13%) – The unique menu items here are among the many reasons that Jiko has become a fan favorite from day 1. Items like Grilled Wild Boar Tenderloin ($17) and Spicy Botswana-style "Seswaa" beef short rib ($42) are not likely to show up on the menu at your local steak house. The restaurant also boasts a huge selection of South African wines for you to experience with your meal. When this restaurant first opened, they offered a Filet Mignon on a bed of homemade macaroni and cheese atop a red wine reduction that was so good you would, quite simply, die. This immediately became a 'must have' among the restaurant's legions of fans but when a new chef took over it was removed from the menu - and the villagers revolted. While the outcry was not enough to return it to the menu, they will still make it if you ask for it - and you'll be glad you did!! 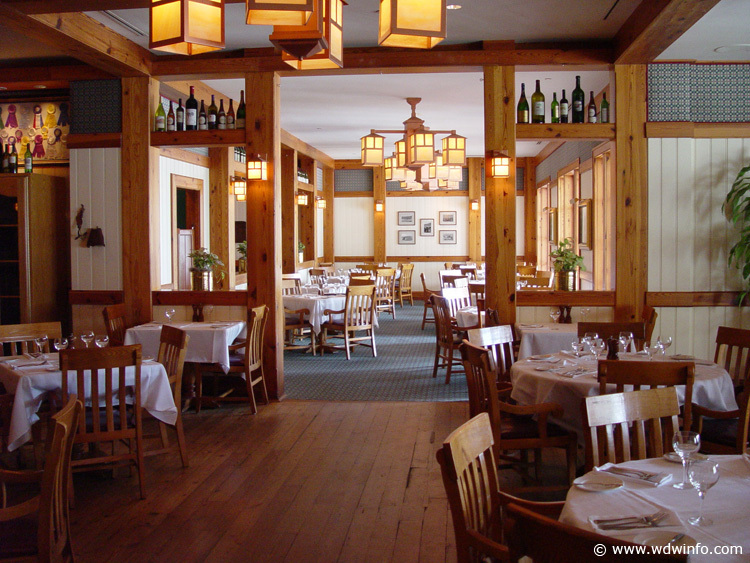 #2 – Yachtsman Steak House (18%) – The venerable standard of signature dining at Walt Disney World has tons of devotees and for good reason. Located at Disney's Yacht Club Resort, the Yachtsman defines casual elegance and outstanding service. The 16oz boneless Rib-Eye ($43) may be the Yachtsman's signature dish - but don't overlook the 12oz Prime New York Strip ($48). The Lobster Bisque ($12) is among the best you'll ever have. #1 – California Grill (32%)– Located atop the Contemporary Resort, the California Grill is - by a mile - our listeners' #1 choice. Lesser restaurants would phone in the cooking when they had a view of the Magic Kingdom like this one does. Instead, this amazing restaurant continues to delight and exceed already absurd expectations. After the recent rehab and menu overhaul, it got even better. While the menu changes seasonally, you might find such dishes as Bison Tenderloin ($50) or Spanish Seafood Pilaf ($47) on the menu. The California Grill is well known for having (arguably) the best sushi at Walt Disney World and the Dragon Roll ($25) is among the most popular. This is also a great place to view the fireworks at the Magic Kingdom. Even if you eat earlier in the evening, they invite you to come back (and show your receipt) and enjoy the fireworks from the lounge or the catwalks outside the restaurant.This should be a ‘must-do’ on every vacationer's itinerary. So, there you have it. If you're thinking about doing one (or all) of these great restaurants on your next visit, rest assured you are in good hands and you're in for an amazing meal!